For other uses of "The Telegraph", see The Telegraph (disambiguation). De Telegraaf (Dutch pronunciation: [də ˈteːləɣraːf]; English: The Telegraph) is the largest Dutch daily morning newspaper. The paper edition had a daily circulation of 430,686 in 2015. Paul Jansen has been the editor-in-chief since August 2015. De Telegraaf was founded by Henry Tindal, who simultaneously started another paper De Courant ("The Gazette"). The first issue appeared on 1 January 1893. Following Tindal's death on 31 January 1902 the printer HMC Holdert, with backing from financiers, took over De Telegraaf and De Courant on 12 September 1902. This proved to be a good investment, particularly with regard to De Courant, enabling Holdert between 1903 and 1923 to take over one newspaper after another, suspending publication as he went. He added the name Amsterdamsche Courant ("Amsterdam Gazette") as a subtitle to De Telegraaf, and Het Nieuws van den Dag ("The News of the Day") to De Courant. In 1926, he began construction of a new printing facility at the Nieuwezijds Voorburgwal in Amsterdam, designed by J.F. Staal and G.J. Langhout. Construction was completed and the building occupied in 1930. At one point, in June 1966, the building was besieged by angry construction workers and Provo followers, after a false report that a victim of a labour dispute had been killed not by the police but by a co-worker. In 1974, De Telegraaf moved to its current location in the Basisweg. During World War I, when the Netherlands was officially neutral, Holdert's French sympathies and his pro-British standpoint caused De Telegraaf to be the focus of some controversy, as the Netherlands were usually pro-German at the time. During World War II, the Telegraaf companies published pro-German papers, which led to a thirty-year ban on publishing after the war. The prohibition was, however, lifted in 1949 and De Telegraaf flourished anew to become the biggest newspaper in the Netherlands. De Telegraaf is based in Amsterdam. Paul Jansen is the editor-in-chief of the paper that is owned by the Telegraaf Media Groep, which also publishes the free daily Metro. De Courant/Nieuws van de Dag ceased publication in 1998. In 2001. De Telegraaf was also published on Sundays between 21 March 2004 and 27 December 2009. 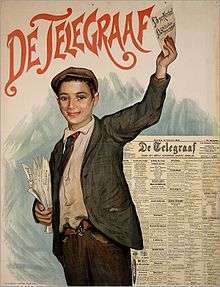 De Telegraaf was published in broadsheet format until October 2014 when the paper began to be published in full tabloid format. In the period of 1995–1996 De Telegraaf had a circulation of 760,000 copies, making it the best-selling paper in the country. In 1999, the circulation of the paper was 808,000 copies, making it the ninth best selling European newspaper. It was the eighth top European newspaper with a circulation of 807,000 copies in 2001. Its circulation was 488,902 copies in 2013, 455,727 in 2014, and 430,686 in 2015. This national newspaper contains many "sensational" and sports-related articles, and one or more pages the content of which is supplied by the gossip-magazine Privé ("Private"). The financial news coverage, however, is more serious in tone. The paper targets a broad audience, mostly in a conservative and populist style, attracting specific target groups for the paper's advertisers. The newspaper not only reports news, but also actively campaigns in political issues. 1 2 3 Lars Pasveer, "Parool, Trouw en Volkskrant vergroten printoplage" (in Dutch), Villamedia, 2016. Retrieved 24 June 2016. 1 2 (Dutch) Haro Kraak, "Gaat Paul Jansen de crisis bij De Telegraaf oplossen? ", de Volkskrant, 2015. Retrieved 1 August 2015. 1 2 Adam Smith (15 November 2002). "Europe's Top Papers". campaign. Retrieved 5 February 2015. ↑ "Telegraaf moves to compact format and Metro becomes more complete". Publicitas. 10 October 2014. Retrieved 16 November 2014. ↑ Media Policy: Convergence, Concentration & Commerce. SAGE Publications. 24 September 1998. p. 7. ISBN 978-1-4462-6524-6. Retrieved 1 December 2014. ↑ "Top 100 Dailies 1999". campaign. 24 November 2000. Retrieved 12 February 2015. ↑ (Dutch) "Betaalde oplage grootste kranten daalt verder", De Telegraaf, 2014. ↑ (Dutch) "Papieren oplage kranten daalt verder", NOS, 2015. Retrieved 1 August 2015. ↑ Hermes, Joke (2005). Re-reading Popular Culture. Wiley-Blackwell. p. 39. ISBN 978-1-4051-2245-0. Retrieved 5 February 2010. ↑ (Dutch) Sara Berkeljon, "De Telegraaf helpt rechts een handje", de Volkskrant, 2012. Wikimedia Commons has media related to De Telegraaf.